Clare and the Chocolate Nutcracker is an original dance presentation written for Orlando Community Arts Inc.
We invite you to take a journey with Clare through her enchanting dream as she travels with the Chocolate Nutcracker and the Sugar Plum Fairy to the Kingdom of Toys. The scenes are filled with the pageantry of dazzling costumes and exciting dance moves performed in ballet, stepping, jazz, modern, swing, gospel and hip hop. This adaptation of the popular classical ballet, The Nutcracker, by E.T.A. Hoffman and music scores by Tchaikovsky and Duke Ellington's Nutcracker Suite. Call (407)613-7650 for auditions times. 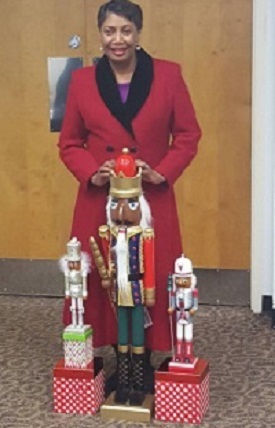 Beverly Page is the President & CEO of Orlando Community Arts, Inc. She is also the Producer/Writer of the community-based holiday production, Clare and the Chocolate Nutcracker, which has been issued a United States of America Patent and Trademark. She is a graduate of South Carolina State University with a Bachelor degree (B.A.) in Drama/ Speech Communication. She has a-graduate degree (M.A.) in Education and post-graduate credentials in Education Leadership/Supervision from Winthrop University and post graduate credentials from Furman University in Drama. We invite you to take a journey with Clare through her enchanting dream as she travels with the Chocolate Nutcracker and the Sugar Plum Fairy to the Land of Toys. The scenes are filled with the pageantry of dazzling costumes and exciting soulful dance moves performed in ballet, jazz, modern, swing, gospel, and hip-hop. Clare and the Chocolate Nutcracker is an adaptation of the popular classical ballet. A wonderful treat for the family this holiday season. Beverly Page is author of the new children's book 'Clare And The Chocolate Nutcracker.' She has also designed the Chocolate Doll and the Clare Doll, both soon to be available forpurchase on Amazon. and of course at the show.